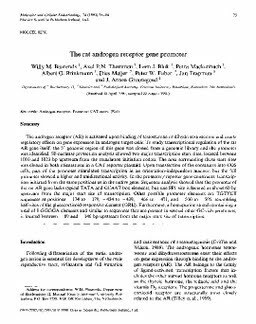 The androgen receptor (AR) is activated upon binding of testosterone or dihydrotestosterone and exerts regulatory effects on gene expression in androgen target cells. To study transcriptional regulation of the rat AR gene itself, the 5' genomic region of this gene was cloned from a genomic library and the promoter was identified. S1-nuclease protection analysis showed two major transcription start sites, located between 1010 and 1023 bp upstream from the translation initiation codon. The area surrounding these start sites was cloned in both orientations in a CAT reporter plasmid. Upon transfection of the constructs into COS cells, part of the promoter stimulated transcription in an orientation-independent manner, but the full promoter showed a higher and unidirectional activity. In the promoter/reporter gene constructs, transcription initiated from the same positions as in the native gene. Sequence analysis showed that the promoter of the rat AR gene lacks typical TATA and CCAAT box elements, but one SP1 site is located at about 60 bp upstream from the major start site of transcription. Other possible promoter elements are TGTYCT sequences at positions −174 to −179, −434 to −439, −466 to −471, and −500 to −505, resembling half-sites of the glucocorticoid-responsive element (GRE). Furthermore, a homopurine stretch containing a total of 8 GGGGA elements and similar to sequences that are present in several other GC-rich promoters, is located between −89 and −146 bp upstream from the major start site of transcription.